Thank you Stonyfield and Woodstock for sponsoring today’s post. As always, all opinions are my own. I’m back again with another quick overnight oats recipe. I’m exhausted. Having a newborn is exhausting. Then throw in a crazy hyper toddler and I feel like I’ve turned into a mombie (you know, a mom-zombie)! Thankfully, my husband stayed home from the office the first week we got home from the hospital. He owns his own business too, so this was a big deal. He did work from home and took our crazy toddler into the office a few times to sign documents and such, while I rested with the baby at how. My mom has been with us during the last 2 work weeks! Thank goodness–it’s allowed me to attempt to catch up on some much needed sleep. Well, not really catching up on sleep–just surviving with a little bit more sleep. I’m finding I need at least one good 2-hour nap during the day to function. I’ve been left a few times now with both kids and I’m happy to say I survived and the kids did too! One thing I’m realizing as a new mom of two is that I need quick and easy breakfast and lunches for myself. Who am I kidding… I need easy dinners too. But really my most recent goal is to make sure I feed myself breakfast and lunch. Here’s where I came up with another overnight oat recipe! 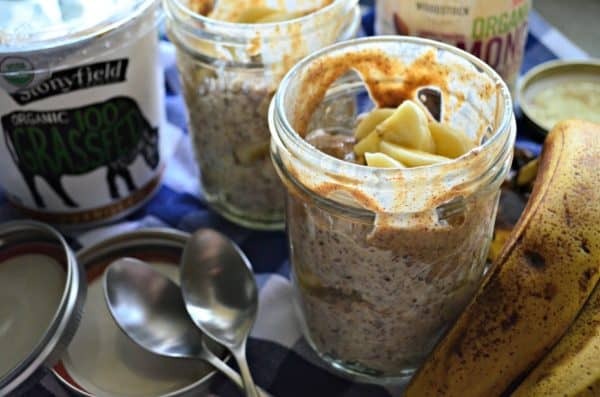 I’m loving this new variation for Banana Almond Butter Overnight Oats. Making this takes less than 10 minutes when you don’t have kids pulling you each way. If you do, it might take you longer. Just saying–I might know from experience. I like to make two at a time so that I get a little variety in my life. I also like using fresh fruit in my overnight oats, and I find after two days the fruit tends to get a little soggy. For this recipe, I used Stonyfield Grassfed Vanilla Yogurt. It’s creamy and has the perfect amount of flavor. What’s different about the Grassfed yogurt you might ask? Milk from cows who graze naturally on lush grass gives yogurt a rich and unique flavor. And like all Stonyfield products 100% Grassfed is organic, non-GMO and made without the use of artificial hormones. I mixed in just a half cup of the yogurt and half cup of milk into the oats. The next day, when you go to eat the oats you can add additional yogurt or milk to get the consistency you desire. For this recipe, I used Woodstock Organic Almond Butter that was also mixed into the oats and then I added a nice dollop of additional almond butter on top after the oats were in the jar. This almond butter is one simple ingredient, almonds! That’s it. 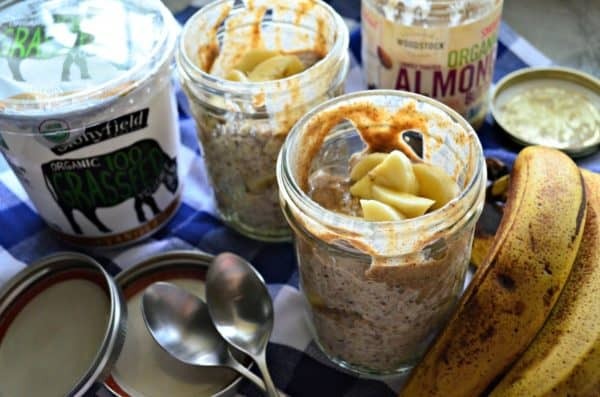 If your feeling exhausted and need a hearty breakfast that is on the healthier side, then I invite you to try my recipe for Banana Almond Butter Overnight Oats. It’s what is keeping me fueled during these very tiring days with a newborn. In a bowl, combine together the rolled oats, ground flaxseed, Stonyfield Grassfed Vanilla Yogurt, milk, honey and 2 tablespoons Woodstock Almond butter. Mix well and set to the side. Chop both banana into bite size pieces. Place a few at the bottom of each Mason jar. Then place part of the oatmeal mix into the jars, followed by more chopped banana, top with one additional layer of oatmeal mix. 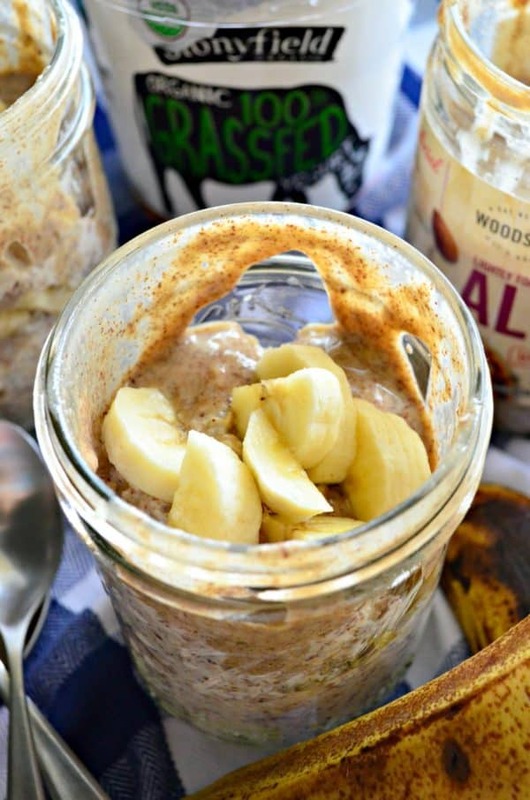 Place one tablespoon Woodstock Almond butter on top of each Mason jar and top with remaining chopped bananas. *You can use instant oats for an instant breakfast, they will also hold well in the refrigerator for 1-2 days. 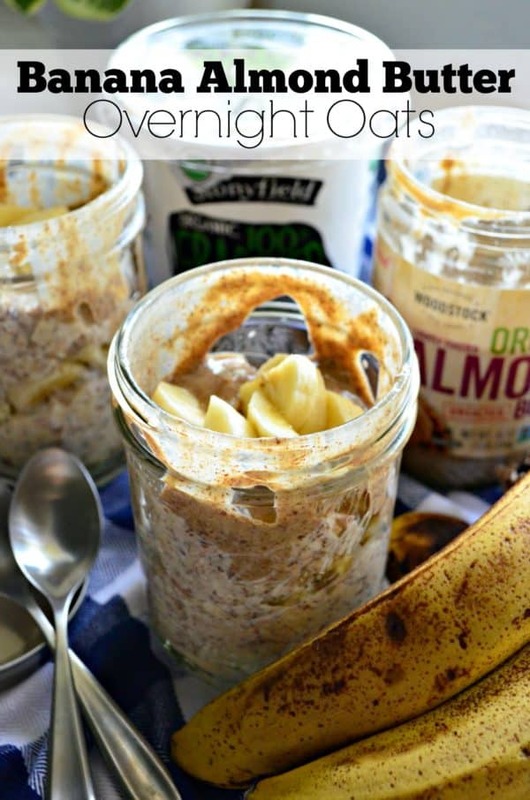 This sounds an amazing flavor combo for overnight oats! I bet both the yogurt and the AB make these oats creamy and filling! Yes, Bethany–so creamy and filling!